Life as a Pregnant Diabetic: WEEK 19 - FIRST ULTRASOUND! Our technician was excellent and very friendly. She was so nice and answered all our questions and took us on a little baby-tour. We got to see him/her from all angles, and she pointed out his/her organs to us, and even his/her little beating heart (you can see all four ventricles pumping)! Technology is truly amazing! We weren't able to talk to a doctor about the results when we were there, but the technician assured us that one of the doctors there would be reviewing the results when we were gone and that the results would also be sent to my OB. She did mention, however, that the baby was measuring a bit small. She said the measurements were consistent with a baby of about 17 weeks, not 19 weeks. So...we may be a bit off on the conception date (and, as a result, the due date). We were really pretty sure about the date, but there's always a chance that we're wrong. I also had an appointment with my endocrinologist this week and spoke with her about the effect of diabetes on the size of the baby. She said that, while diabetics' babies tend to be bigger, some can be smaller too...but that the unusually small ones are typically those belonging to diabetics who are smokers (which I am not) or who have very bad control (which I do not). She really didn't seem to think the size was a diabetes issue, nor did she seem to think it was anything to be concerned about. She said she thinks everything's going well from a diabetes perspective and she's happy with my control (of course with constant "tweaking" necessary as the pregnancy changes my insulin needs). 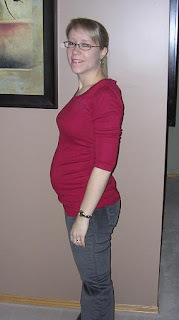 Here’s my 20-week picture! Look! I look pregnant!!!! !